The only legitimate child of the famous English poet Lord Byron, Lovelace considered herself an “analyst and metaphysician” who took an interest in hypnosis and phrenology. She collaborated closely with Charles Babbage, whom she met in 1833 at the age of 17. Much of her career is attributed to her outstanding contribution to Babbage’s Analytical Engine (a mechanical general-purpose computer developed in 1837). Born Augusta Ada Byron on December 10th, 1815, in Piccadilly Terrace, Middlesex (now in London), England, Ada Lovelace (full name Augusta Ada King, Countess of Lovelace) became an eminent and influential mathematician, writer, and the world’s first computer programmer. Her parents, Annabella Milbanke Byron and Lord Byron, separated briefly after her birth and although her father was allowed by the English law to get full custody of Ada, he gave up his parental rights (he did ask his sister to inform him about his daughter’s welfare, however). Annabella moved in with one-month-old Ada to Kirkby Mallory, Leicestershire. Although her mother was the only parent she knew, the mother-daughter relationship was not very good. As a result, Ada was left in the care of her grandmother. Lord Byron died in 1824 when she was only eight years old, so she never had the chance to meet him in person. Ada Lovelace had various health problems throughout her life and in 1829 she became paralyzed after suffering from measles. She recovered gradually and in 1831, she could walk, but only with crutches. 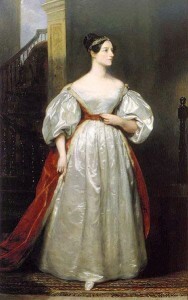 As a child prodigy, Ada Lovelace was passionate about scientific developments, mathematics, and computational mathematics in particular from an early age. She developed the design for a flying machine when she was only 13 years old. She was educated by tutors, including Mary Somerville, for whom she had a great amount of respect and with whom she corresponded many years. Mary Somerville was the one who introduced her to Charles Babbage. Ada was encouraged by her mother to study logic and mathematics, disciplines which she believed were able to counteract the poetical tendencies that she might have inherited from her father and which Annabella considered “insanity.” Her professor of mathematics at the University of London was Augustus de Morgan, who helped her career a great deal. Lovelace’s work opposite British mathematician Charles Babbage, who was also a professor at Cambridge and her lifelong friend, was the most significant part of her career. Between 1842 and 1843, she translated works from French and annotated a memoir written by Italian mathematician Luigi Menabrea, who supported Babbage’s Analytical Engine. Impressed by her analytical skills and highly-developed intellectual abilities, Babbage referred to Ada as an “enchantress of numbers.” In addition to being the founder of scientific computing, Lovelace aimed at creating a mathematical model that she called “a calculus of the nervous system.” Her detailed annotations simply entitled Notes are the main source of her achievements throughout her life and moreover, these notes are deemed the first computer program, anticipating future developments in computer science. In her Notes, she described an algorithm representing how the proposed mechanical general-purpose computer (the Analytical Engine) could be programmed to compute Bernoulli numbers and to solve complex problems. This is considered the first algorithm developed for implementation on a computer. In 1953, the Analytical Engine was recognized as an early model for a computer. On July 8th, 1835, Ada married William King, 8th Baron King, and they had three children. In 1838, she became Countess of Lovelace. Ada Lovelace passed away on November 27, 1852, at 36 years old, due to uterine cancer complicated by excessive bloodletting (at her doctor’s advice). At her request, she was buried next to her father, whom she had never met, in Hucknall, Nottingham, at the Church of St. Mary Magdalene.